Overview Created for Now Play This, Malapropic Karaoke is a game that challenges users to sing their favourite Karaoke songs with altered, sound-alike lyrics. The new lyrics are randomly generated on the fly using a rhyming dictionary api. Malapropic Karaoke is a game where the participant has to sing a familiar song with new, nonsensical lyrics. We developed the game into a full installation for Now Play This - A gaming festival at Somerset House - where members of the public enter a glittered room, full of dancing lights and other karaoke-booth inspired gewgaws, and challenge themselves to sing a near-homophonic, version of a classic karaoke song. The installation comprises a custom built karaoke machine that offers the participant a selection of songs to choose from as well as difficulty options. The 'Easy option' leaves some of the original lyrics unchanged and the 'Normal' option changes all of the lyrics. Once a song and difficulty is selected, the application generates new lyrics using a rhyming dictionary API. The program randomly selects words with the correct number of syllables - to ensure the lyrics still scan properly - and uses them to replace the original lyrics. The rest of the program functions exactly as a normal karaoke machine does - displaying the words and highlighting them as they need to be sung. 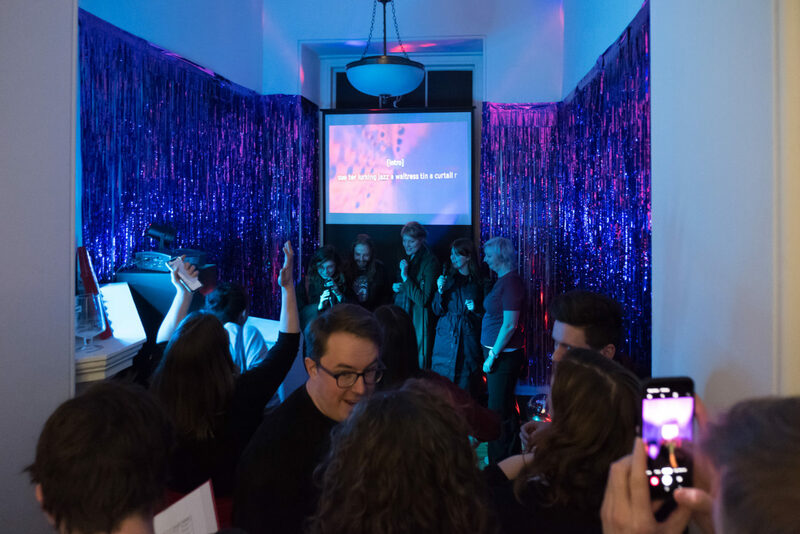 The room itself is decorated in the style of a traditional karaoke-room and includes glitter, disco lighting and binders containing the available songs. The idea for the game came from our fascination with misheard lyrics - also known as mondegreens - and how this phenomenon can often produce more interesting lyrics than the originals. One example being "My love has got no money, he's got his tambourines" in place of "My love has got no money, he's got his strong beliefs" from the song Freed From Desire by Gala. With this as a starting point, we built a prototype program that allowed us to generate new lyrics for our favourite songs that would be presented to us in the form of karaoke. We built custom programs that generated the sound-alike lyric files to work with our own karaoke application, which handled the playback.